In-progress art for Tabanica: Finding Home by Viktor Jones. Will be replaced with final art when finished. 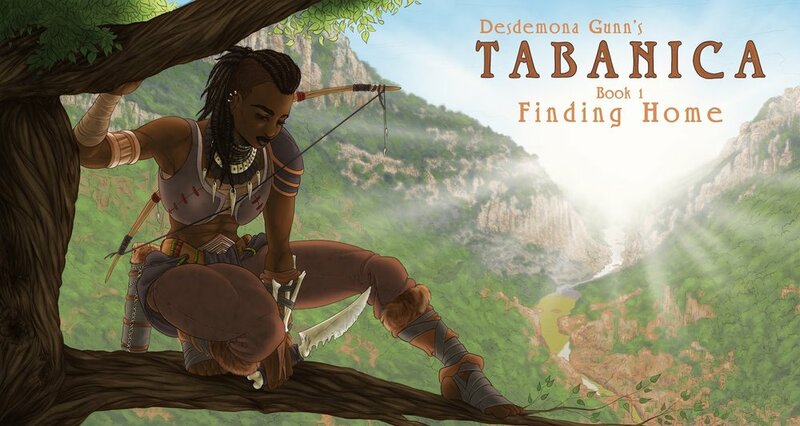 Here's the first chapter of the first book of the Tabanica saga: Finding Home. These are going to be novellas, so likely no longer than 10 chapters per book. Please enjoy the first installment, and if you want more, check out the ongoing story for $4/month here. I’d have to say it was when the eagle’s talon went into my eye socket that I realized hunting might not be for me. Obviously, my parents were horrified. I mean, an eagle was attacking my face, they had good cause to be. See, in my society, everyone had a niche. Hunters are highly esteemed, some of the most recognized members of our little village. I mean, I grew up just dying to be like Sklypna. She was the huntmaster and had been for many years; could see in the dark like a hawk, could move for kilometers without making a sound, she was absolutely incredible. I dreamed of being a hunter and moving through the brush like her, coming home with a beast dragged by sled, the whole village cheering at me. My parents knew this, obviously, so they encouraged me. There was, however, a slight hitch in the plan. Hunters are among the magic users of the village, one of the very few. We had healers (life magic, obviously), Hunters (telepathy), and the occasional Preserver. We never had a preserver in my lifetime, they didn’t come often, and to be honest, I don’t know what school they practiced. I was told they were used to preserve food. One of the Preservers of yore, Zamani, would go out on hunts with the Hunters, and was said to use his preservation abilities to stun beasts and stop intruders in their tracks. Obviously, this is story passed down, but like I said, I never saw one. I can’t speak to their abilities. Well, magic, as you well know, is hardly something one can train in. You either have it or you don’t. In my tribe, it was accepted that those without arcane gifts were simply out of luck. I was determined, though. I was going to be a hunter, I had to be. So I practiced with my bow, I snuck around the village on the regular, I worked on my strength training, and finally, turns down the road, at about the age of 150, I could do the test. Sklypna herself did the tests, as she wanted to personally witness each potential hunter’s abilities. I was starstruck, slightly, and determined not to let her down. The tall, impossibly muscled woman strode away into the trees, her body moving like she was aware of every bend and step. In seconds, she was gone from sight. I sat myself down and counted. I counted long and hard, making sure not to miss a single number. I was likely being watched, and they’d know if I got up too soon. So I sat on the dirt counting carefully until finally, after an eternity, I hit five hundred. I rose, dusted off my leather pants, and started into the trees. My village, you see, was situated deep in the Kladbiche, southern Runnir. I know, you think of Runnir, you think of the Avazi desert, takes up most of it, but there’s a mountain range goes east-west that blocks off a chunk of far south Runnir. Most of it is thick rainforest jungle, it’s called the Kladbiche in most of the world. We didn’t have a name for it, since it was our entire world. We barely knew about the shadow-skinned men on the other side of the mountain, let alone the many shades of people lighter than us all over the world. I probably should have made that clear. We were isolated. I was in a village in the northern Kladbiche, within a cent or two of the mountain range I was just talking about. We rarely went to the coast; everyone seemed to think it was too dangerous. Didn’t find out why ‘til later. But even so, when you grow up in a claustrophobic jungle, the ocean seems downright terrifying in its emptiness. So I had my trees, my rivers, and the mountain north of us. Occasionally, we would run into the shadow-men from the other side of the mountain; climbers would sometimes scale the cliffs and explore the other side. They always attacked us on sight, so we never got the chance to talk to them. I wouldn’t learn about their way of life for many turns to come. Anyway, back to the trial. I was used to trees, so moving through them was nothing new. I had trained my entire life for this. I scaled a tree, climbing high off the ground (but hardly to the top; these trees reached enormous heights sometimes, and the canopy was rarely strong enough to support weight. Good view when it could, though). From the branches, I scanned the floor for signs of her movement and caught broken twigs. I followed them, noting a footprint in the moss showing me direction. I knew Sclypna was intentionally leaving hints, but she was far sneakier than any prey we tended to hunt. She was testing my ability to hunt boars and capybaras, not other hunters. I followed the light trail of footprints, broken twigs, and markings on trunks, careful to hop branch to branch wherever possible, making as little noise as I could. After what felt like a solid cent of travel, I found her. She sat between two trees eating a piece of meat noisily. I crept through the branches, trying my best not to alert her. After a short eternity of inching along the trees, I found myself above her. I lowered myself to a branch below me, so as not to break my legs on the fall, and dropped. My arms wrapped around her neck and I pinned her to the ground, flinging her back. She laughed and patted my back, letting me up. I could hardly sleep. Sklypna had not only passed me, but enthusiastically passed me! I was on cloud nine, I had adrenaline pumping through my veins like I couldn’t believe. Rest eluded me for at least a cent before exhaustion finally caught up. After waking, I left my quarters to find the Huntmaster sitting with my mother at the base of our tree eating over a fire. I laid down on the planks outside my room, on the third floor of the tree, listening intently. “You don’t have to tell me twice, Huntmaster,” my mother laughed coyly. She finished Hunter’s training in her youth, all the way to taming her first beast, but was injured in a fight. She lost one arm entirely, and the use of the other. That hardly stopped her. She could still track with ease, walked silent as the night, and somehow learned how to shoot a bow with her feet. During my crafting phase, I even designed a special bow to use with feet. Isaagorn, the local bowyer, used my design and crafted her a special bow. Since then, she had been sentry for town. I remember her trying to teach me to use this bow that I designed my damn self, and her just laughing. “I guess,” I would mutter as I shot another foot arrow into the jungle, meters off of my target. She sighed and grabbed the pot from the fire. The answer mulled around in her mouth while she poured into cups, then stayed a while longer while she sipped her guayusa. She always had a pot after waking to get her perked up, then drank throughout her watch to keep herself sharp. Oh, you guys don’t have that, do you? I’ve only ever seen it in the Kladbiche. I need to steal some seeds and see if I can grow it elsewhere, I swear I could sell it by the barrel. It’s an herb native to my home that’s pretty similar to tea. You boil it hard, pour it off, and it makes a delicious drink. The difference is tea gets bitter if you leave it in too long. Guayusa can just keep going until it’s strong enough to strip a boar. It’s also stronger, richer, earthier, and has more caffeine, at least in my experience. It’s less versatile than tea, though. Well, I say that, but we only ever roasted it. After harvesting, we’d crush the leaves and roast them in an oven just a tad, then load them into little boxes. I don’t know what would happen if you smoked them like a black tea, or steamed them like a green. Who knows? Regardless, now I really want some, and even if I leave now, I wouldn’t have any for turns. Ugh. Anyway, she was sipping on her guayusa when my heart sank. I didn’t hear the rest of the conversation, as I was busy going back to my room and crying. It shouldn’t have hit me that hard, but the idea that my dream job, the one I trained for and excelled at so far, would be out of my reach because of something out of my control devastated me. I cried for a while, then tried to tame the beetles that crawled on my walls. It didn’t work, not like I knew how to cast a spell. Hell, I didn’t know how to draw up magic at all, let alone form it. I’d never been magically inclined. My buddy Fylhoraeth was a training Healer, and we had sat down and tried to make me cast before. She wasn’t very good at describing the feeling, though, so every effort proved fruitless. This in mind, I closed my eyes, meditated on my pain a short while, then, when I found myself calm, I wrote a short message explaining my need for her assistance, wrapped it around an arrow, grabbed my bow, and shot the message to her door. My aim proved true as it stuck in the wood right in front of her room. The long-haired beauty popped her head out of the tiny hut built into the side of the tree (as all “houses” were there), stepped on the arrow, read the note, then looked up at me. I made a “get over here” gesture and stepped back into my hut. I have to get it this time, I told myself. I have to.